Novosibirsk, Russia, June 9, 2009 – LEDAS Ltd., an independent provider of variational design tools known as Driving Dimensions plugins for different CAD platforms, today announced the beta release of its new plugin Driving Dimensions 0.1 for Rhino 3D. With this plugin, Rhino users get a powerful tool for bottom-up assembly design and kinematics simulation with assembly constraints compatible with the capabilities of mainstream MCAD software packages. 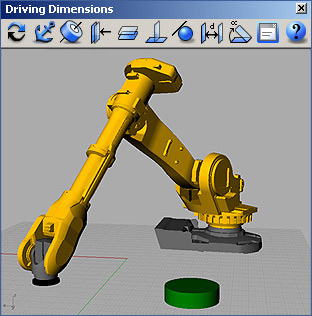 With Driving Dimensions 0.1, Rhino users can easily position their 3D parts with respect to each other by specifying assembly constraints (fixation, concentricity, coincidence, parallelism, perpendicularity, or tangency) and driving dimensions (distance and angle) between their faces and edges. Driving Dimensions plugin automatically satisfies all constraints and dimensions making a consistent assembly from existing parts. An assembled mechanism can then be animated by varying a parameter of one of its driving dimensions. A constraint manager tool allows easy navigation over all assembly constraints and driving dimensions imposed on geometric elements of a designed model. "We are happy to share our many-years industrial experience in development of variational modeling tools with Rhino users,” said David Levin, the founder and CEO of LEDAS Ltd. "Our Driving Dimensions plugin for Google SketchUp has been extremely successful - more than 9,000 users downloaded it in 7 months. We hope for even greater reaction from Rhino users." "We helped LEDAS to develop their first parametric plugin for Rhino," added Bob McNeel, the founder and the President of Robert McNeel & Associates. "There is a big interest in dimension driven blocks/parts/components in Rhino." A free beta is available for download at www.DrivingDimensions.com. Driving Dimensions 0.1 for Rhinoceros is compatible with Rhino 4.0 and above and can be run on 32-bit Windows XP and Vista. A detailed on-line help, text and video tutorials, and a set of examples are provided for the users of Driving Dimensions plugin for Rhino 3D. Driving Dimensions are end-user applications developed by LEDAS as plugins for popular 2D and 3D modeling systems to provide advanced parameterization capabilities to their users. Driving Dimensions are based on the Variational Direct Modeling technology, which uses direct (history-free) editing model elements, preserving its design intent, expressed by explicit and implicit driving dimensions (linear, angular, radial) and geometric constraints. Simultaneous satisfaction of geometric and dimensional constraints is achieved with LGS variational geometric solver, which is being developed by LEDAS since 2001 and is available for licensing to all CAD developers. More information about Driving Dimensions portfolio of applications can be found at www.DrivingDimensions.com. LEDAS Ltd. is an independent software development company founded in 1999; it is based in Novosibirsk Scientific Centre (Akademgorodok), Siberian Branch of the Russian Academy of Science. A leader in constraint-based technologies, LEDAS is a well-known provider of computational software components for PLM (Product Lifecycle Management) solutions: geometric constraint solvers for CAD/CAM/CAE, optimization engines for project management, work scheduling and meeting planning as well as interval technologies for knowledge-based engineering and collaborative design. The company also provides services for PLM market: software development, consulting, reselling as well as education and training. More information about LEDAS is available at www.ledas.com.